We at Restaurant Catering Systems are always on the lookout for ideas to make our clients' lives easier. We rely on clients like Mike from The Couch Tomato. Mike called me a few weeks ago to inquire about our system printing out small labels for his catering prep staff to use to mark packages of food as they are prepped. Please watch the brief video below for details and read the rest of the article to get a sample set of labels. So if the first order of the day had two full pans of spaghetti and two large salads, he'd want a label for each one. As his prep team made the food, they'd just peel off a label to put on the pan, tray lid or package. I thought it was a great idea and took it a step further. Some catering prep items equate to one package per prep item, like whole pizzas, pans of food, etc. Other catering prep items take multiple prep items and place them into a single container. If your kitchen had to prep a hundred chicken breasts for an event, that may end up in only five full aluminum pans. You definitely don't want "chicken breasts" to end up on a hundred seperate labels. That would be a waste of labels and time to print them. 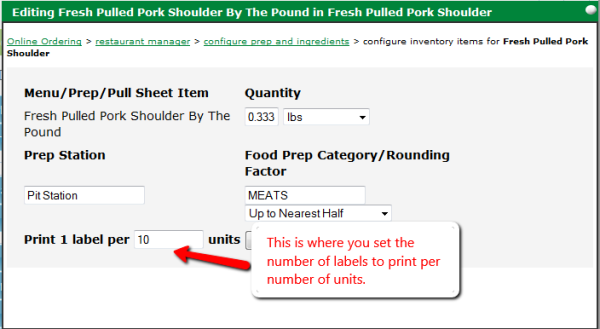 In order to set the number of labels needed, you go into the RCS Restaurant Manager and modify your prep item formula. Below is a screen shot. Click Here To Download A Sample Sheet of Labels. The labels can be sorted by a variety of times and include: The Prep Station Name, Catering Client Name, Catering Client Company Name, Order #, Ready Time/Date and Prep Item. Please call Restaurant Catering Systems at 615-831-1676 with any questions or to set up a free, no obligation catering consultation session.